The aftermarket car part industry encompasses a wide range of products used for vehicle repair, maintenance, and enhancement. Many of these aftermarket products serve as replacements for essential car parts, built — or sometimes rebuilt — explicitly for the purpose of replacing worn-out or damaged original equipment manufacturer (OEM) parts. Specialty aftermarket parts intended for added convenience, comfort, and aesthetics are also available. These aftermarket products — as well as any related products, such as specialty tools and equipment — are purchased by all types of customers: wholesalers and distributors, retailers, repair and service garages and facilities, and individual do-it-yourself consumers. The aftermarket is nearly as varied and complex as the automobile industry itself; for virtually every standard car part, there is an aftermarket version available. The aftermarket auto part and auto body part sectors are complex, global industries. Both OEM and aftermarket part industries are thriving in North America, with high very levels of trade between Canada, Mexico, and the United States. Meanwhile, American exports to other global markets — particularly the East Asian markets of Korea and Japan, as well as Middle Eastern markets in the United Arab Emirates (UAE) and Saudi Arabia — are fairly limited, leaving considerable room for growth. Because East Asia has its own regional automobile manufacturers and relies heavily on OEM aftermarket parts and services rather than seeking parts from independent shops, there is considerable competition in this area. U.S. manufacturers, therefore, must find ways to set themselves apart from the crowd. But Middle Eastern markets — the UAE and Saudi Arabia being the largest — are very different. With no local automobile manufacturers, almost all vehicles and parts are imported. This represents massive, low-competition expansion opportunities for aftermarket car parts manufacturers. Whether you’re nurturing domestic markets or seeking to expand in untapped areas internationally, it’s imperative to maintain a quality part inventory. Given the international climate — valuable but competitive markets in Asia and wide-open opportunity in the Middle East — working with a technologically advanced, innovative automotive metal stamping company is key. With 35 years of experience in the aftermarket auto parts industry, AIC has a deep knowledge of the industry and is committed to staying up to date on all important automotive aftermarket news. With the cutting-edge equipment and the most advanced technology, we have what it takes to produce reliable, precise parts. 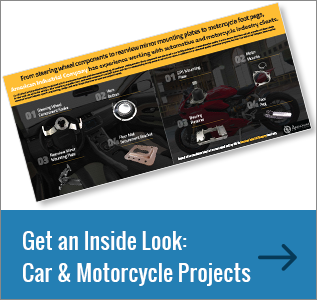 To learn more about our automotive metal fabrication capabilities and how we can help with your next project, download our free automotive part infographic or contact us today.